Is there any truth to the idea that we haven’t evolved fast enough to cope with modern life? To some extent it is true. Our bodies are ill-suited for sitting at computers all day, for example. Because humans evolved in an environment where they were not crouched over computers, sitting that way all day is going to have ill effects. But it’s more nuanced than that. Being bipedal has a lot of costs on the human skeleton, too. Should we all long to be quadrupeds? It just doesn’t make sense. What is driving the tendency to idealize the way ancient humans lived? There is this caricature that organisms evolve until they get to a point when they’re perfectly adapted to their environment, then heave this big sigh of relief and stop. Anything that happens to them after that is disastrous. This attitude can be referred to as “paleo-nostalgia” — the notion that we were all better off before agriculture, or civilization, or the Industrial Revolution. It’s not to say life has been unmitigatedly getting better. But it’s more helpful and accurate to see that all organisms are constantly evolving. There has been no point in our past when we were perfectly adapted to our environment. I’m not dismissing the idea that you need to look at our evolutionary heritage to think about what’s best for us health-wise. But when you start plucking out pieces in an oddly specific way, you can run into trouble. Are paleo diets examples of this type of specific selection? These are predicated on the idea that there was a certain way humans ate 100,000 or 15,000 years ago — the era people want to hark back to varies. I think everybody agrees that we evolved eating certain things and we’re going to be very unhealthy if we subsist on Diet Coke and Cheetos. But it gets more complicated when you look at the details. How much do we know about early human diets? We don’t really know what they were eating. It’s turning out that they may have eaten more starch and carbohydrates than we had realized. They also ate different things in different parts of the world. So it’s hard to come up with this one perfect human diet that everybody was eating. Plus, our genes have changed in the last 10,000 years. Lactase persistence — the ability to digest milk as adults — is the poster child for this. Our genes have changed extremely rapidly so that at least some populations of humans can digest milk into adulthood. And just as with lactose, it turns out that in human populations that consume a lot of starch, there are more copies of genes that allow starch breakdown. All of this suggests that evolution is happening all the time and much more quickly than people think. 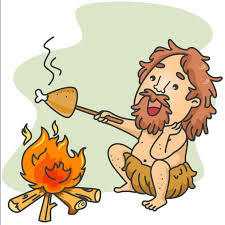 So is it possible to truly eat like our ancestors? Trying to emulate what people ate 10,000 or 100,000 years ago is really difficult. Our foods have changed so much that virtually every item in a supermarket is drastically genetically different from its prehistoric equivalent. This is what humans do: We modify foods so that they become more palatable and digestible.